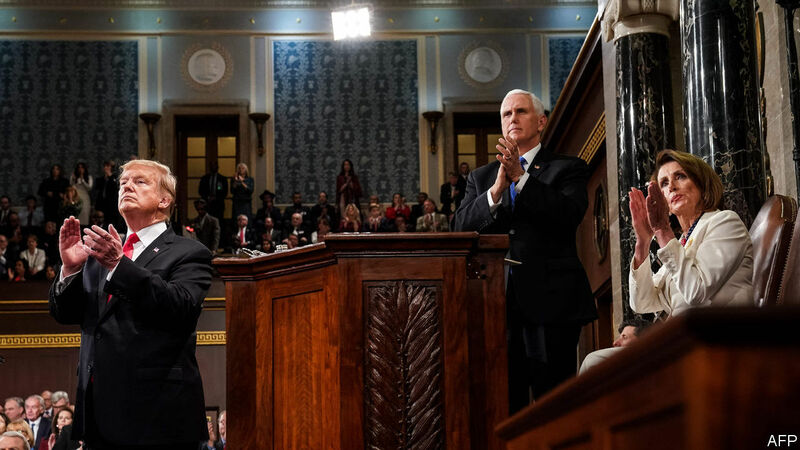 AS DONALD TRUMP’s second State of the Union (SOTU) speech trundled into its second hour, something genuinely touching happened. Mr Trump introduced Judah Samet, a Holocaust survivor who narrowly escaped slaughter at the Tree of Life Synagogue in Pittsburgh last October. Mr Trump mentioned that it was Mr Samet’s 81st birthday—whereupon the entire chamber sang “Happy Birthday”. It was a moving and unexpected moment in an otherwise rather predictable speech. That is not a knock on Mr Trump’s effort. SOTUs are designed to be predictable: Americans know the views of the presidents who deliver them. Barack Obama did not repudiate Roe v Wade; George W. Bush never endorsed Richard Dawkins’s atheism. Before the speech, senior administration staff had confided to hundreds of reporters that Mr Trump would deliver a bipartisan appeal that would “encourage Congress to…adopt a spirit of contribution and compromise.” One could imagine Mr Trump, chastened by the lessons of a painful shutdown caused by his intransigence, focusing on issues of genuine bipartisan interest, such as infrastructure and prescription-drug pricing. Both those things rated a brief mention, but in the main Mr Trump’s calls for bipartisanship were really calls for his opponents to lay down their arms. America needs to choose, he said, between “results and resistance.” “If there is to be peace and legislation,” he said, “there cannot be war and investigation.” The first pairing of antonyms is a simple truism—peace and war cannot co-exist. And the second, as multiple presidents can attest, is simply untrue: governing does not end because an administration is being investigated. That applause line fell flat. The one that worked came unexpectedly. Mr Trump mentioned that 58% of the jobs created in the past year went to women—whereupon Democratic women, wearing suffragette white, rose and cheered (Mr Trump acknowledged them in the next sentence). He urged Congress to appropriate money for his wall (though he did not threaten to declare a national emergency, or shut down the government again should it fail to do so). “Walls work and walls save lives,” he said, though border-security experts and even anti-immigration hardliners in his own party favour a more varied approach to border security. “So let’s compromise, work together and reach a deal that will truly make America safe”—in other words, you compromise and give me what I want. The president touted his economic achievements—and here he sounded, by and large, like a more conventional occupant of the White House, taking credit for macroeconomic trends beyond any single politician’s control. He said that more Americans than ever are working—which is true, though that is largely because there are now more Americans than ever (the employment to population ratio today is below its level in the late 1990s). He urged Congress to pass the NAFTA-replacing trade agreement hammered out with Mexico and Canada, as well as the Reciprocal Trade Act, a bill that would introduce tariffs on imports equal to the tariffs faced by American exporters. The latter, at least, seems vanishingly unlikely, and would probably do a great deal of harm if passed. The foreign-policy section of his speech contained both a vow to bring American forces home (“Great nations do not fight endless wars”—rhythmically a nice line, though powerful nations have long dabbled in military adventurism) and some sabre-rattling at Iran. He announced a summit with Kim Jong Un, North Korea’s leader, at the end of the month in Vietnam. Rhetorically, the speech aimed at sweeping grandeur. The president forcefully denounced anti-Semitism. It was thrilling to see Congress applaud former prisoners, in the part of the speech devoted to the bipartisan First Steps Act. But there was no substantive boldness. Most of the speech was a restatement of known goals and wishful thinking. And it came from a president who finds himself hemmed in by messes of his own making: a wary relationship with Senate Republicans, born of his having proven an unreliable negotiating partner before and during the shutdown; a confrontational one with Democrats in both chambers; and Mr Mueller’s investigation grinding inexorably forward. America is peaceful and prosperous. Setting the political mood aside, the state of the union is strong. The same cannot be said for the state of Mr Trump’s presidency.